My hands are always dry no matter what time of year it is and when I find a hand lotion that works I try to buy vats of it. 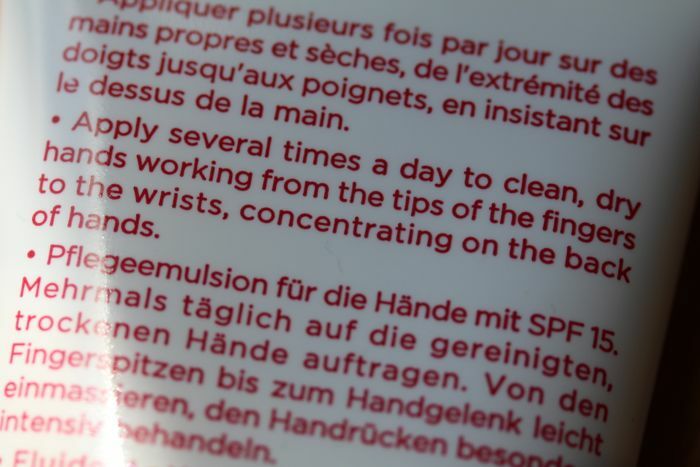 Clarins Age-Control Hand Lotion is, how do I put this nicely, well, a dud. It's a lotion, I'll give it that, but it doesn't hydrate my hands and cuticles. Just look at it. It reminds me of Elmer's glue, smells (faintly) similar to toilet cleaner and sunscreen and the effort expended on massaging this stuff onto my hands isn't even worth it. I've tried to like it, but this hand lotion has failed to deliver repeatedly. A scathing review for a brand that has otherwise, pleasantly surprised me on other occasions. 1 out of 10 bags — I'll be reaching for my far superior and better smelling staple hand lotion. I think I'm good for the moment. Sorry, Clarins.